It seems one of the great messes of the NFL, the Cleveland Browns, might want Greg Schiano to remove them from laughingstock status. Per Joe’s pal Alex Marvez of FOX Sports and SiriusXM NFL Radio, the former leader of the New Schiano order interviewed for the Browns’ vacant head coaching gig today. Joe’s confident Schiano will interview very well. He’ll be impressive and detailed. He’ll sell how he was railroaded by leaky, sleepy Josh Freeman. He’ll explain how he fulfilled Team Glazer’s cleanup mandate and had things going in the right direction. He’ll explain that he kept a locker room together during the toughest of times. He’ll look, sound and feel like a leader. Now exactly how Schiano will explain why his team was pulverized over and over and over again in the second halves of game is another story. That was bad coaching, not bad luck. Frankly, Joe hopes Schiano gets the Browns job, and Joe thinks Schiano has a darn good shot at it. The best thing about it would be Schiano surely would move quickly to trade for Mike Glennon. Schiano couldn’t rave about the kid more than he did, and that extended to Schiano’s farewell news conference that he hosted at a local Tampa hotel. Heck, Schiano might even authorize a trade down in the first round with the Bucs just to get his hands on his golden child. No way he gives up the buyout from the Glazers, he’ll make them pay every cent. Makes sense…Brownies gave another Italian Stallion, Mangini, his 2nd head coaching gig. How’d that go? I don’t know how the Browns ownership could sell a Schiano hire to their fans after his mess here in Tampa. If there’s any organization that would make that irrational move though, it would be them. Having said that, I’m with you Joe. I hope he does get the job and want Glennon that badly. I highly doubt it, but we can all dream. He gets hired by the Browns, trades down with the Bucs and we get Johnny Football. Hasn’t Cleveland suffered enough as a city? Funniest caption Ever….lmao. But I like schiano, I really wouldn’t of been upset if he stayed. If hired by Cleveland and he gets a quarterback , he will win some games and if we don’t win then the Glazers will be forced to sell the team. When nobody else wants the job, call Schiano. Please make it happen and he can hire Raheem as his DC! LMAO that caption was hilarious! Then no points EITHER half! That’s one interview more than Dominick…that must hurt. Wow, I have a question for the Joe’s. 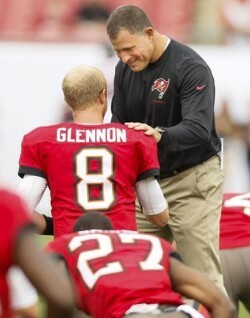 If Coach Schiano did bring Glennon to the Browns and They have success together will you be happy or sad about it? Will you post it? Or if we draft a flava of the draft QB this draft and they do not meet hyped/hoped results will this be posted as well? I hope we keep Glennon as our QB, if we draft another QB this year that is not a bad thing, as long as it is not one of our first 3 picks. I keep hearing how we have the 4th best QB in our division with Glennon. What rank is our Oline and our WR, TE, RB (not on IR) compared to the other teams in the NFC South? My hopes are we shore up our aging limited production Oline be that due to injury or play on the field. I would love to see some fresh stout faces in our Oline. Be they Drafted or FA’s or Undrafted FA’s as long as they can play. We do have a few good backs to have some holes open up for them would be a huge plus to our passing game. I want a DE with a 10 sacks average, I do not care where they come from. I want to see us get a true #3 receiver or a #2 who has to battle to show what he has, not be anointed after the draft. Schiano got a bad rap. I hope he succeeds. Good luck coach! That’s too bad, it would have been a great shot for the Bucs to trade up. I bet Gregory would trade Josh Morgan, if he gets hired. Morgan doesn’t seem like a Schiano Man. Plus, who needs a big play receiver in an offense more concerned about turning the ball over than about taking calculated risks? There is an irony in this. Schiano is very often compared to Bill Bel. and it was the Browns who did not think Bill could succeed. Bill went on to be the most successful coach in modern history. Schiano made some mistakes, but you can bet he learned from them. I think he will do very well if he gets the job. And you can kiss Clowney goodbye if he does. That means either OT or QB at 7. I don’t by the LB predictin for a second, not with who our new GM is. Oh, and no way he does a trade with Tampa either. Nobody actually compares him to Bellichick. Somehow Bellichick likes him cause his son walked on at Rutgers. He parlayed that to an NFL gig. Be delighted to trade him Glennon! Just wondering what Universe you live in. The Glazers own the team, exactly who’s gonna ‘force’ them to sell ? The NFL ? the Fans ? get real ! Hoo boy, these comments from the Gregory defenders are crazy hilarious. News flash: You can’t be successful if you run a zero risk offense that doesn’t score points. That point will never be drilled into Gregory’s thick skull. A Schiano Man is risk averse. Cleveland ownership seems too impatient to make that hire, but I hope he gets it. Being a part of the mythical Glennon Mob myself I can’t for the life of me understand why so many Bucs fans want to give up on this guy so quickly but would trade away draft picks for an unknown QB in the upcoming draft (or for Kevin Kolb, I mean Matt Flynn, no I mean Ryan Mallet)? News reports are they interviewed him on Bellchicks recommendation. If cleveland hires this man , they will have solidified first place as the worst run franchise in football. From pop warner league on up. See we got another idiot Fritz50..when I said Forced I didn’t mean it that way you uckin idiot. Wow! Talk about the blind leading the blind. Schiano didn’t get a bad rap, he didn’t adjust his methods/gamelan and failed miserably by his own doing. Case in point, the 49er game. Bucs scored 2 TDs with the hurry-up offense but as soon as they slowed it down it was 3 and out after 3 and out. After the game he was asked why he didn’t use the hurry-up offense more. His excuse? “We didn’t practice it”. Hmmm. First off, if you didn’t practice it, why use it at all. Second, shouldn’t the team be practice that since it might be needed at some point during the season? Third, it was working, why not keep doing it until they stop it? Smh…he might be an outstanding person, be he is a horrible coach. At least with the Bucs. He actually had some talent here went 11-21 what do you think will happen when gets that roster up there? Geez. Its like buying tickets to a trainwreck. He can have Glennon , Bowers , Teo , and the list goes on and on. I interviewed for a job at the Federal Reserve once. When they asked me if I’d ever stolen anything, I asked “who me?”. I never got the chance to answer anymore questions. I figure Schiano’s interview might have been similar when he was asked If he had ever won anything! He might just get the job. Numerous head coaching candidates have asked for their names to be removed from the list: Todd Bowles, Ben Mcadoo, Adam Gase OC from the Broncos, Josh Mcdaniels, you get the idea. It seems no none wants this job. I have no ill wills for coach Schiano and wish him the best of luck. With that being said, I like the direction the Bucs are headed under the new coaching staff. You can’t expect to get very far when you walk in the door and say “I heard you guys were hiring”! Cleveland has five pro bowlers. Their fans think they are “talented” too, from reading their blogs. Just like ours. George Warhop left Cleveland too early….he could have stayed and opened up the running game for the Browns…..run up the middle on first and second down…pass on third, then punt…..
Schiano’s going to have to remake himself before he is seriously considered for another HC job anywhere! Belichick is turning over his staff, he should give Schiano a job. NIMBY! From what I’ve read it was just an interview and they really have no plans on hiring him. Mary Kay Cabot of the Cleveland Plain-Dealer said that the Browns won’t be hiring Schiano and were simply interviewing him. So with that… end of the non-story. Jason LaCanfora says he’s still a candidate. But he’s probably not on the top of their list. The Browns are entering desperate territory. Seems half the league’s coaches have turned them down. For all of you dumb fans on here schiano is a very good coach. Did he fail to adapt to the nfl quickly , IE today’s modern and diverse schemes? Yes. Do I think him losing his job will force him to realize he needs to adjust especially on offense? I do. Bellichik was the exact same way. Now is schiano the next bill bellichik? I wouldn’t go that far to say yes. But they are similar. Both football savvy and fundamentally sound guys. If schiano makes the proper adjustments he will flourish. Unfortunately he’s not going to do it in Tampa. I am happy with lovie and his staff. But I do see schiano being successful his 2nd go around. Schiano in Cleveland! What did these fans do to deserve this? Brown fans must be livid to hear this story. But they are last H.C. vacancy available. You know the rule you gotta pick Greg. Good article, Joe, and a very interesting story. I definitely agree with your take – he comes across like a head football coach out of central casting. If he can learn from his mistakes he has a chance of being a good head coach someday. If he can learn from his mistakes. If we give up on the only young QB we have for less than a second or first round pick, we are idiots. There are certainly no guarantees that even if we draft someone with the #7 pick or move up, that he will play better his first year or two, or if he is a big time scrambler even survive the first season without some season ending injury. I want to see a high pick or talented FA QB brought in…but letting Glennon go, and if he does well in Cleveland and our QB selection doesn’t turn out to be a Franchise guy, we would be the laughing stock of the league again. But it would be interesting to see the fans and sports writers find ways to explain a couple more sub .500 seasons, when they got exactly what they wanted. If Browns hire him, we have a great shot at their draft positons. Why, you might ask? Because Schiano has shown proficiency in letting other teams poach him. Success with the Browns would be a stretch for Schiano. Since I am not a Browns fan, and have zero loyalty to Schiano, I hope the Browns try the experiment. The article on Schiano going to Cleveland was a good one and I agree he has a strong chance of getting the hire. This is simply because NO OTHER COACH WANTS THE JOB. As for the Glennon remark, when did the Big Log starting writing for Joebuc? This type of pathetic dissing of “our” players is what has already driven several people I know away from this site and is quickly making me reconsider my loyalty to the site. Stating your opinion is fine everyone has one, but bashing a young player for no reason other than your man crush on an unproven college prospect is absurd. Just a little FYI to the Glennon haters he finished his rookie year in a horrible offensive system without his #1 RB, #2,3, WR’s, he never had a true TE and finished the year ranked 22nd in the league amongst all QBs. Im sure that there are atleast 10 teams looking at him saying they would take him. I in no way a Glennon fan, I want the bucs to bring in a vet and a rookie (just not from the 1st rd) to compete with Glennon. I just don’t see the point of continuously bashing on the young man and you are absolutely insane to think the Bucs are going to trade away last years starter at worse they will hold onto him as a safety net. the bill belichick comparison falls apart when you look at schemes. belichick always knew how to make a plan to beat the other guy, as evidenced by 2 superbowl rings as a coordinator. schiano was the king of getting outschemed. furthermore, belichick is legendary for his adaptability of his schemes and getting the most out of marginal players. conversely, schiano is as inflexible as they come and can’t make use of a player who doesn’t fit his exact profile. the comparison seems to begin and end with their common perception as arrogant jerks. bet the eagles wish they traded that nick foles kid. after all, he’s goofy looking, a 3rd rounder, and he didn’t have as buzzworthy a rookie season as RGIII, luck, or cam newton, so he’s never going to be any good. right? Foles had to beat out Vick. 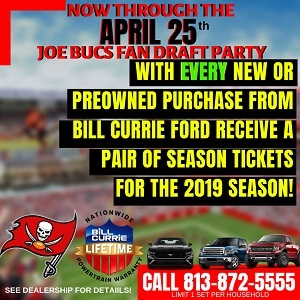 If we bring in another QB and Glennon beats him out so be it, all bucdom (including Joe) would be very happy. Can’t count on that though. Foles may not be the final answer in Philly either. Chip Kelly probably wants a mobile QB too. The Brownies probably interviewed him for the special teams coach. I heard Brown’s interviewed Schiano for “facilities manager” position. We are comparing Schiano to Belichick now? Mercy.